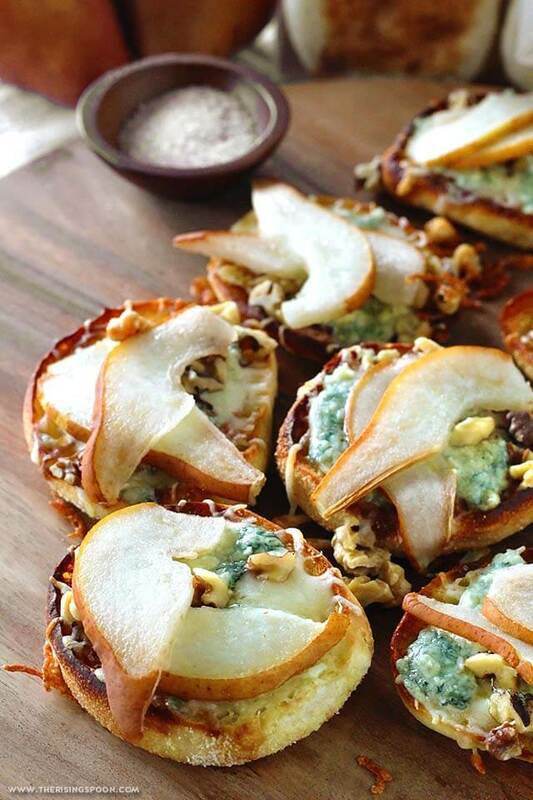 Looking for quick & easy appetizers to serve at holiday parties during the cooler months? 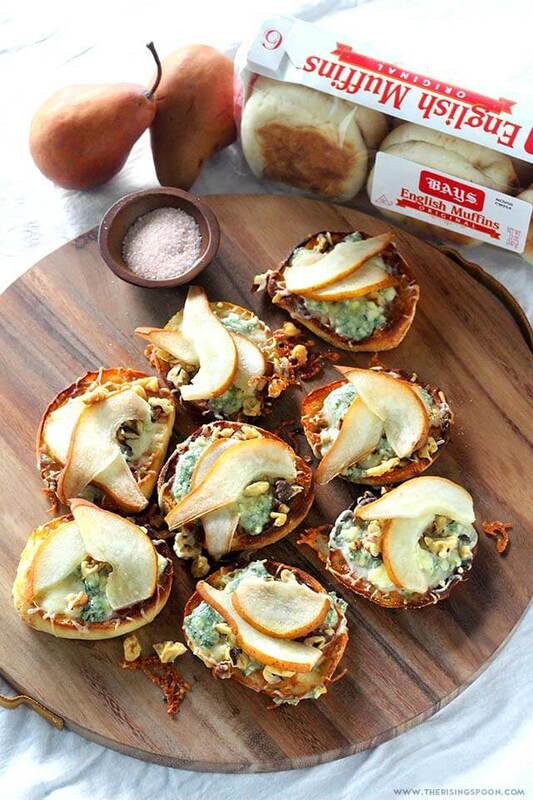 Bake a batch of these simple, yet elegant Gorgonzola Pear English Muffin Pizzas in only 20 minutes from start to finish. Impress your guests with the seasonal flavors of fall & winter without all the hard work! 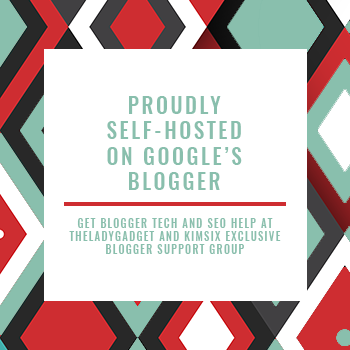 This is a sponsored blog post; while the views expressed here are genuinely mine, consideration was paid to me by Bays English Muffins to review this product. 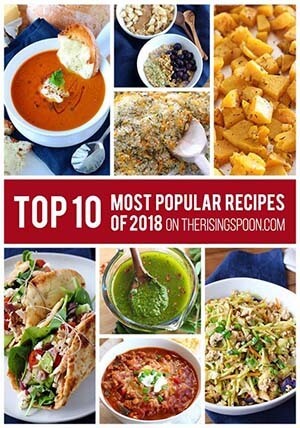 In my 10 Meal Planning Tips For Beginners post, the 6th tip I share is "Keep Your Freezer Stocked with Homemade Staples or Wholesome Convenience Foods." It makes throwing together an on-the-fly meal or snack way easier and saves you money since you can skip an extra trip to the grocery store. Two foods that I'm obsessed with and have stocked in my freezer 99% of the time so I never run out are Kerrygold butter and Bays English Muffins. These English muffins are downright fabulous, so they deserve the best tasting grass-fed butter slathered on top of them. I also love buttering all the things, like boiled artichokes, parmesan chicken, and bulletproof coffee so it would be a true emergency if I ever ran out. Priorities. Bays sourdough English muffins are my favorite (I love the tang & sourdough is good for your belly), but I like to buy a carton or two of the original version when I'm back in Kansas or Colorado visiting my family. For breakfast, we love making over-easy fried eggs served with pan-fried avocado, sauteed veggies, a bit of sauerkraut, and toasted buttered English muffins. I either dip the muffin in the egg yolk (YUM) or smash my warm, garlicky avocado on top to make "avocado toast." However, Bays English Muffins are amazing and convenient any time of the day (not just for breakfast). Because I always have a pack in my fridge or freezer, I'll quickly toast up English muffins sprinkled with shredded cheese for dunking into homemade soup (like sausage & potato soup or creamy tomato basil soup). For a last-minute midnight snack, I'll slather a toasted one with peanut butter and raw honey (paired with a steamy mug of chamomile & nettle tea + a good book). Of course, a classic way to use English muffins outside of breakfast is for mini pizzas. They're the perfect vessel for sauce, shredded cheese, and toppings and only take minutes to prep & bake. The light, chewy crust hides the sauce and can hold quite a few toppings like pepperoni, olives, or sliced veggies. Speaking of the crust, are you wondering how to make your English muffin pizzas not soggy when adding plenty of sauce? Here's the key: lightly toast your muffins first. The crisp edges create a barrier so the sauce won't absorb into the bread as quickly. The most popular way to fix English muffin pizzas is with spaghetti sauce, shredded mozzarella cheese, and sliced pepperoni. Easy peasy, especially for kids. But since we're in the holiday entertaining season, I thought you might want to try something new to impress your guests. So, I'm sharing a fall & winter-focused version of English muffin pizzas made with simple, seasonal toppings that pair well together. Ingredients like ripe sliced pear, crumbled gorgonzola (it's like a softer flavored blue cheese), shredded Italian blend cheese, chopped toasty walnuts, a hefty drizzle of olive oil, and a sprinkle of Himalayan salt. Since this recipe has very few ingredients, it's important that they're high quality. That doesn't necessarily mean expensive but made well and fresh. So, pick a gorgonzola cheese with a taste you like (find a grocery store with a cheese section where you can sample it first), genuine extra virgin olive oil (one with a slightly peppery flavor would be good), fresh walnuts (nuts go rancid quickly sitting at room temp), and Bays English Muffins as the base since they are super fresh with no additives. Bays English Muffins are made differently than other English muffins so you won't find them in the bread aisle. Instead, look in the refrigerated dairy case of your local grocery store. 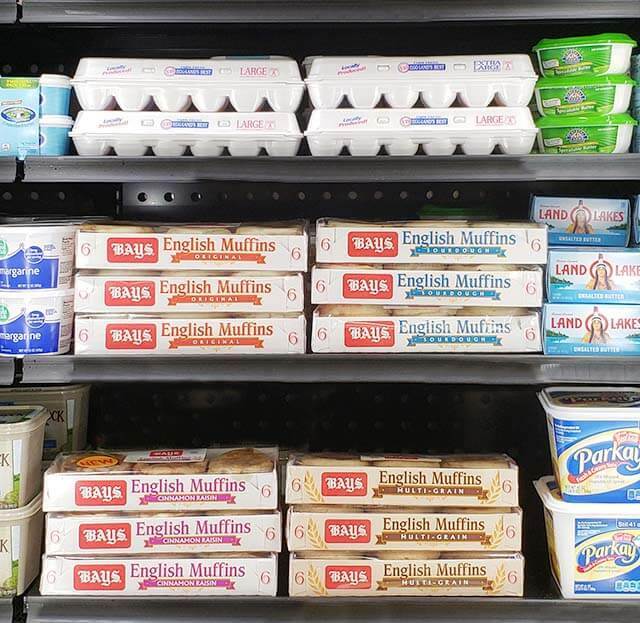 They're kept right next to the eggs and milk, carefully chilled for freshness. I'm partial to the sourdough and original flavors, but they also have cinnamon raisin and multi-grain. I like to grab three or four packages at a time and stick the extras in my freezer so I never run out. Are you ready to become obsessed with these English muffins like me? 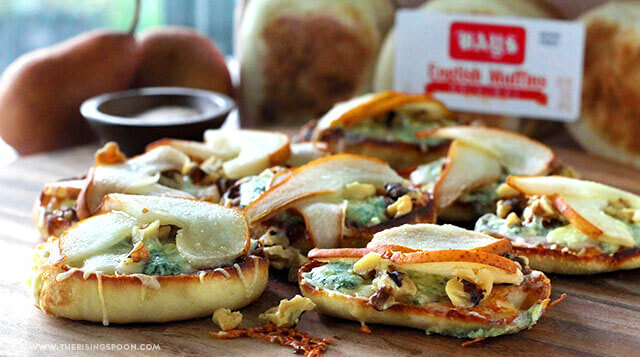 Visit the Bays English Muffins website for more recipe ideas, plus find out which grocery stores near you carry their muffins. You can also "Like" Bays on Facebook for fun recipe ideas & videos! If you're a visual learner, make sure to watch my short recipe video by clicking below. 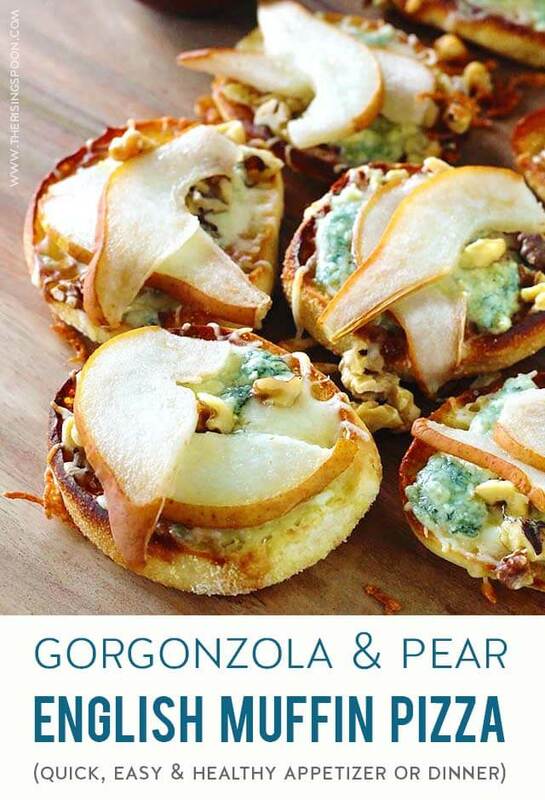 It illustrates the super easy process of making these Gorgonzola Pear English Muffin Pizzas! Heat oven to 400˚ F. Place toasted muffin halves on a foil-lined baking sheet. Drizzle with olive oil and sprinkle with shredded Italian cheese, gorgonzola, and walnuts. Coat pear slices lightly with lemon juice, and arrange over muffins. Bake 10 minutes or until cheese melts. Sprinkle sea salt lightly over muffins, if desired, and serve immediately while still warm.